The crane is decorated with the Komen for the cure logos as well as several names of women that this project is in memory of. Just under those names you will see Psalms 31:24, which states, "Be strong and take heart, all you who hope in the Lord." Bill Lathrop states, "God has blessed our business and our family greatly, we just want to be able to give to those who need it and give God the glory." The Executive Director of the Susan G. Komen for the Cure affiliate in San Antonio had this to say, "The San Antonio Affiliate of Susan G. Komen for the Cure is extremely thankful for the support of B-C Equipment Sales. Their efforts to remember those diagnosed with breast cancer and bring awareness to this devastating disease is truly remarkable. 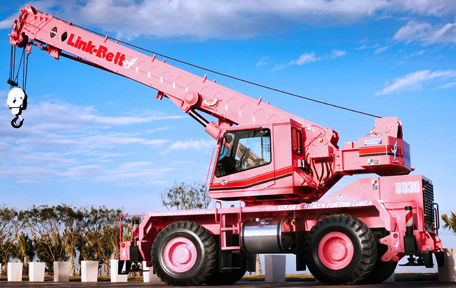 The pink crane is symbolic of hope and determination that we will one day live in a world without breast cancer." This is a unique way to give to a worthy cause. B-C Equipment looks forward to seeing this project succeed. They also look forward to creating more "cause machines", to benefit other organizations that are important to them. 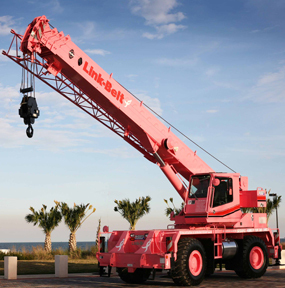 For more information on renting this crane visit either, the Corpus Christi or La Feria, Texas branch. B-C Equipment believes that small businesses can make a big impact. They have already seen people stopping in front of their business to take pictures of the pink crane and their customers are excited about it as well.